Closely related... Koi... Cyprinus carpio... which is the same species as the common carp. 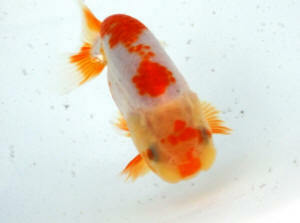 Photo of the Oranda Cat 7 Champion held this weekend. After several attempts at referencing the subject of short and long tailed varieties of goldfish with no luck I have almost given up. I like to exhaust all attempts at solving my own problems before bothering some one like you as I understand you are covered up. I do hope this is a valid request. If not, well, by all means lambaste away! I keep fancy goldfish as one of my many hobbies. 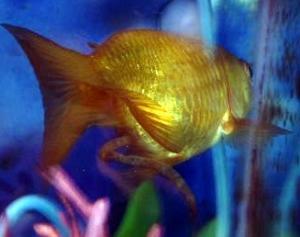 After several years of perfecting the goldfish menu I no longer see the float and bloat fish problems. 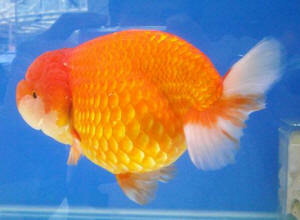 Thanks to the kindness of goldfish breeders and their shared experiences that have gone before me... The diet I feed my Moors, Ryukins and Ranchu, that share my abode, is made up of cooked strained green peas, squash or sweet potato, sardines, sushi seaweed-( I can't recall the name of it-Kim I think- maybe!) gelatin in water with a Acidoliphus tablet added. They also get a steady diet of Elodea, duck weed and algae. The diet seems to work as I have had no problems in over a year with the bloat and float. I also do a fifty to seventy five percent water change every week. Praise be to the ancestors for water wells. My water ph is 6.5 and the nitrites and nitrates are non existent. The water sure does taste good over ice with or without a squeeze of lime! Back to my question! Some of my black moor fish are short tailed and some have long flowing tails. It seems that the short tailed ones have more of a pot belly, have to put more of an effort in their swimming and seem a bit more prone to problems. The black moors with long tails don't have the large pot bellies and move about much easier. The short tailed Moor when resting will stand on their heads and remain stock still in the center of the tanks. The glass tanks are fifty gallons up to two hundred and fifty gallon tanks. The fish outside in ponds don't demonstrate any of these problems. None of the fish swim erratically. 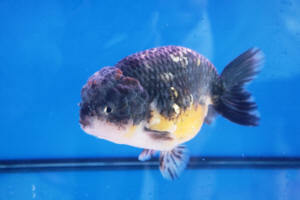 Are there different black moor goldfish or just different genetics and only one kind of black moor goldfish? <Oh, certainly that's the case. 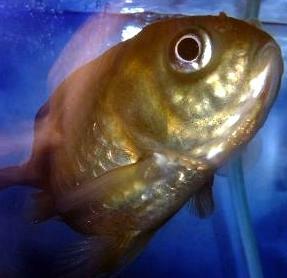 All Fancy Goldfish are inbred -- by definition -- and compared to standard (what Americans sometimes call "feeder") Goldfish they are invariably more predisposed to health problems. An example: I am large and rather rotund. My brothers are tall and bean poles. 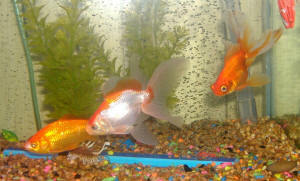 When I purchase black moor goldfish I try and buy the long tailed ones. However some never develop a long tail. I have not been able to find the answer to my question. 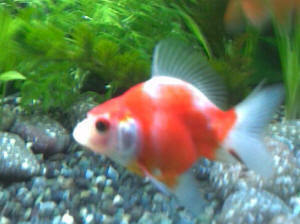 Back when I began the goldfish hobby it was the short tailed fish that had the worst float and bloat problems. I realize that me asking a question is like traveling from Texas to Oklahoma by way of Chicago. You will eventually get there and what a ride. straight back is it a birth defect? 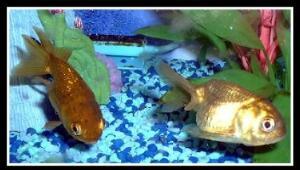 We Finally get to Meet Albert & Teena (the Italian Goldfishes)! >Hi Marina. I hope you're doing well. >>Yes I am, thank you. >This is Marcellino. I've sent you pix of Albert and Teena. If you saw them, can you tell me what species they are? 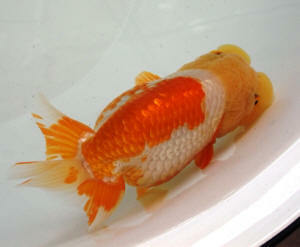 >>They are both (not so good) examples of the lionhead goldfish. 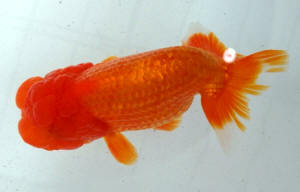 All goldfishes are of the species Carassius auratus. >I thought of Albert a lionhead and Teena an Oranda but I am not sure. 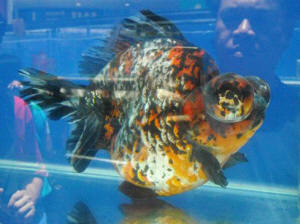 >>Neither fish has a dorsal fin, this is a defining trait of the lionhead. Orandas have dorsal fins, as well as the fleshy growth on the head. 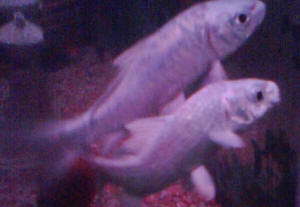 However, neither fish shows the typical fleshy growth about the head, which is also typical of good examples. >The brown algae keep growing all over, should I wait or should I clean it? >>The algal growth I see in your photos is perfectly normal, you'll have to use an aquarium scraper or sponge to remove it - welcome to the wonderful world of aquarium-keeping! >For the rest I followed your advice about live food, daphnia, bloodworms and it seems Albert is doing better with his swim bladder. What do you think about their look? >>The shot of Teena's back end is priceless. 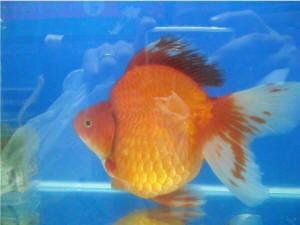 However, I'm going to send you a link to http://www.kokosgoldfish.com - this site appears to have excellent information, as well as some of the BEST examples of each breed. The more I peruse (they even have a link called "goldfish poop"! ), the more I believe you can find great/more specialized information. Honestly, as good if not better than what I can provide you here (but don't take that to mean that we don't like hearing from you).